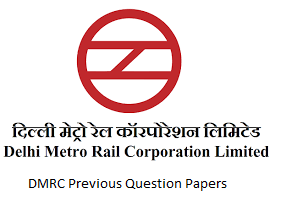 DMRC JE Previous Question Papers Download PDF, DMRC JE Civil Question Papers PDF, DMRC JE Question Paper PDF, Electrical Engineer Question Paper, Mechanical Question Paper PDF -Delhi Metro Rail Corporation Limited (DMRC) has issued a recruitment notification to recruit Assistant Manager, Station Controller/ Train Operator, Customer Relations Assistant, Junior Engineer, Office Assistant, Account Assistant, Stenographer and Maintainer posts. Candidates who are eligible and interested they can apply online mode by visiting the official site of DMRC before the last date. Who is preparing for DMRC jobs they must and should check previous question papers, last year question papers, study material and books for better preparation. Below are the details of DMRC Recruitment 2018 Vacancies Details.